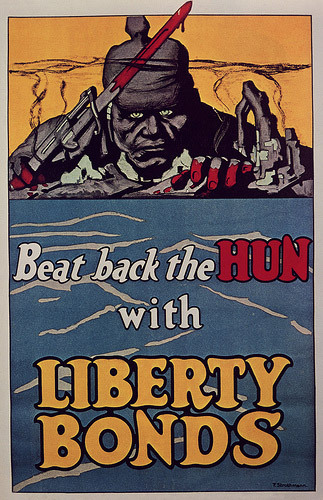 At first, the U.S. pursued a policy which, although formally neutral, penalized Germany and aided its British and French foes. Britain imposed a trade embargo on Germany which, with very little U.S. protest at its infringements of neutral rights, ended up choking off American exports of food, cotton, and other resources to Germany. Meanwhile, the U.S. permitted all belligerents – which, in practice, meant Britain and France – to purchase munitions from the U.S. and, later, to borrow significant sums of money from New York banks. When Germany, in response to the British embargo, began to use submarines to attack British merchant vessels on which Americans might be sailing, the U.S. vigorously objected that submarine warfare of this sort was a flagrant “violation of many sacred principles of justice and humanity.” Protests (including by the secretary of state) that these and other measures were one-sided were met with with accusations of disloyalty and anti-Americanism. Over the next year, the U.S. tightened the screws, issuing an ultimatum to Germany in 1916 to restrict submarine warfare or face the severance of diplomatic relations. A year later, when Wilson was safely reelected and antiwar voices had been further stilled or intimidated, the trap snapped shut: the Germans, now foreseeing that the U.S. would enter the war, decided to resume unrestricted submarine warfare. Wilson, outraged at what he considered the breaking of a promise, broke diplomatic relations, armed U.S. merchant ships, and, after several of the latter were then sunk, called on Congress to declare war. What followed was a comprehensive mobilization of American resources, with an eye toward large-scale combat operations against Germany. 1) Page to Bryan, 10 September 1914, FRUS 1914 , Supplement: 100; “The Peril of German Militarism,” New York Times , 6 September 1914; New York World , 5 August 1914; Root in interview, 7 August 1914; both quoted in Link (1960: 9); House, diary entry 30 August 1914 (Seymour 1926: vol. 1, 293); Wilson interview, 14 December 1914, quoted in Link (1960: 53); Wilson address to Congress, 2 April 1917; Bryan to Gerard, 13 May 1915, FRUS 1915 , Supplement: 395; Wilson, Flag Day speech (14 June 1917); Wilson, Fourteen Points Speech (8 January 1918); Lansing to Oederlin, 8, 14, 23 October 1918, FRUS 1918 , Supplement 1, vol. 1: 343, 359, 383; also Karp (1979: pt. 2); Schwabe (1985: 47-58, 95-117); Knock (1992); Stevenson (2005). Significantly, the Germans had an understanding of the U.S. concern over the nature of their regime and tried several times in the course of the negotiations to address that issue. In the end, although the emperor abdicated and fled the country at the armistice, the German army stayed intact and was used in the touch-and-go months which followed to crush revolutionary outbursts.